An all the way winning performance from Nature Strip in the Group 2 $200,000 Schweppes Rubiton Stakes (1100m) at Caulfield today has seen the classy sprinters consolidate favouritism for the Oakleigh Plate. Nature Strip, above, scores a commanding win in the 2019 Rubiton Stakes at Caulfield. Photo by Ultimate Racing Photos. 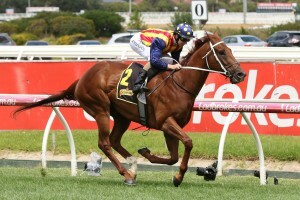 Nature Strip has firmed in from $4.20 to be the $3 favourite at Ladbrokes.com.au for the Group 1 $500,000 Ladbrokes Oakleigh Plate (1100m) at Caulfield on February 23. Nature Strip was having his first run for trainer Chris Waller after arriving from disqualified trainer Darren Weir’s stables earlier in the week and settled into his new surroundings with ease. Regular rider Damian Lane had to click up Nature Strip early after he was a little bit slow to leave the barriers but once the $1.75 favourite got into his rhythm at the 800m mark, the race was all but over. Lane still had a tight hold on the bold striding four year old on the home turn before he careered away in the straight to record a commanding three and a half lengths win. Jungle Edge ($11) tried to put it to Nature Strip in the middle stages and battled on in the straight for second with Thermal Current ($26) holding on for third. “Marginally slow out of the barriers but he was doing quite comfortably in his own tempo and I think he was just in a class of his own today,” stable representative Jo Taylor said. The post Nature Strip consolidates Oakleigh Plate favouritism with Rubiton Stakes win appeared first on HorseRacing.com.au.